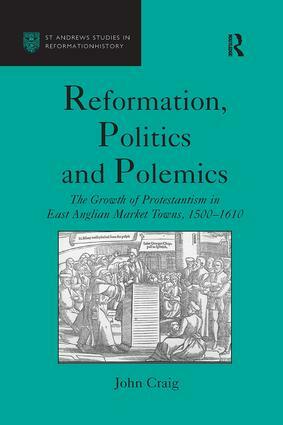 Drawing primarily from Suffolk sources, this book explores the development and place of Protestantism in early modern society, defined as much in terms of its practice in local communities as in its more public pronouncements from those in authority. Using detailed analysis of four communities, Mildenhall, Bury St Edmunds, Thetford and Hadleigh, John Craig explores the responses and initiatives of these towns to the question of the Reformation in the 16th century. A fascinating picture emerges of the preoccupations and priorities of particular groups. The political goals and consciousness of townsmen and tradesmen are examined, and the problems of analyzing the evidence for ascribing religious motivations to urban factions are highlighted. The case of Hadleigh addresses some aspects of the connection often made between the growth of Protestantism and the incidence of social division and conflict. These local studies provide the basis for a broader perspective on urban reformation in East Anglia.